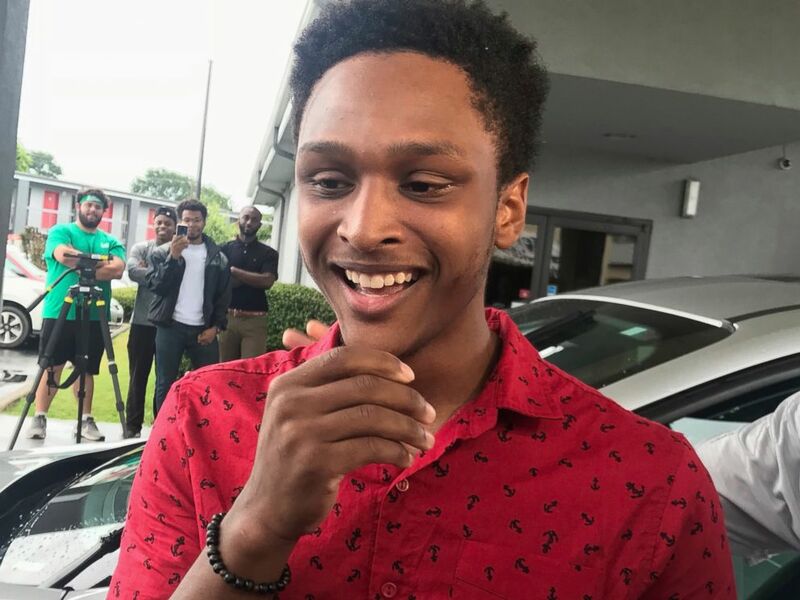 On his first day of work at a location nearly 20 miles from his house, a young man in Alabama said he was left with one option to get there: Walk. After Walter Carr’s car broke down, he was faced with the dilemma of how to get to his job site the next morning -- it was going to be his first day with Bellhops moving company. He decided to leave his house in Homewood at midnight, after sleeping for four hours, and begin the trek to the home of the family he was going to help move. Along the way, Carr sat down because his legs were hurting and he was stopped by Officer Mark Knighten of Pelham Police Department, the department told ABC News. He told Knighten that he had eight to 10 miles left to go in the journey. 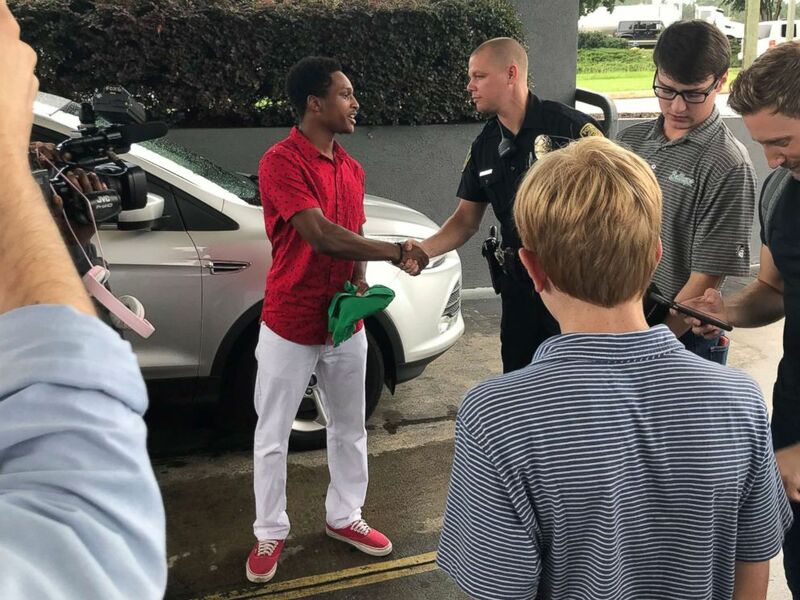 Officers Carl Perkinson and Klint Rhodes pulled up shortly after, the Pelham police added, and all three officers took the young man to breakfast. He told the officers that he was determined to make the long journey to make it to his first day of work. 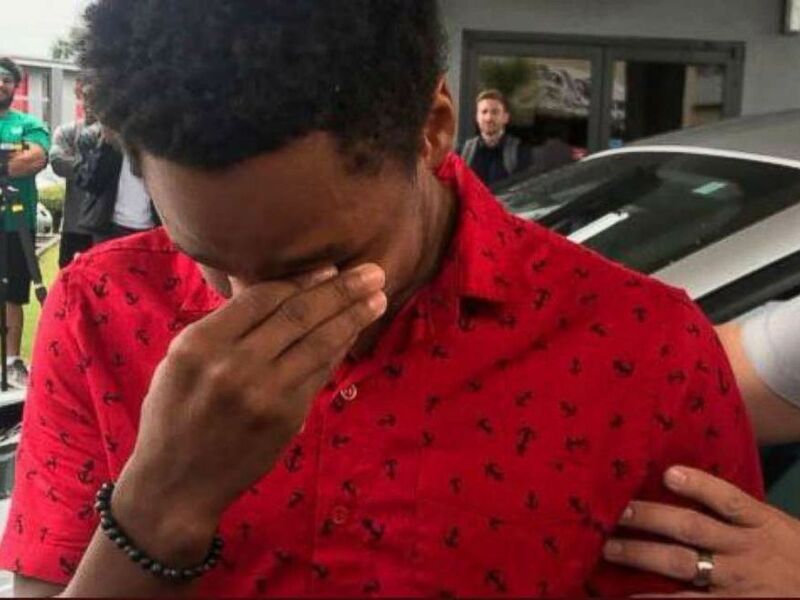 Walter Carr is overcome with emotion after Bellhops CEO Luke Marklin surprised him with a Ford Escape. "I didn’t want to defeat myself," Carr said. At 6:30 a.m. Saturday morning, another officer, Scott Duffey, brought Carr to the home of Jenny Lamey, where was set to meet his new colleagues and begin helping her family move. Duffey told Lamey about Carr's trek and asked if he could hang out at the home until the rest of the Bellhops crew arrived. "My heart just stopped," Lamey told ABC News. She said she offered Walter food and a couch to lie down on until 8:00 a.m., but he insisted they get to work. Lamey said she thought about his all-night walk and how he now would lift heavy boxes in the excruciating heat and it blew her away. "I burst into tears a couple times," she said. Lamey said she learned more that impressed her about Carr. He told her children he was supposed to be receiving his Associate’s degree later this year, then will ship off to boot camp with the Marines. When he was 5 years old, he told her, he and his mother lost their home in New Orleans during Hurricane Katrina. Walter shakes hands with Officer Mark Knighten who saw Carr on the side of the road and picked him up to bring him to breakfast. When the crew arrived and introduced themselves to Walter, Lamey said she was touched that they thanked him for showing up. She said they had been shocked to learn about Carr's all-night trek. Lamey found a way to get in contact with Bellhops CEO, Luke Marklin. She shared the story on Facebook and set up a GoFundMe to raise money for Walter to fix his car. But, Marklin had something else in mind. "Walter is incredible, and what he did is incredible," Marklin told ABC News. "It’s everything our company stands for." Walter Carr shakes hands with Officer Carl Perkinson who was one of the officers that took Carr to breakfast. Marklin drove from his home in Chattanooga, Tennessee, to Homewood, Alabama, to meet Carr for lunch. While Carr walked 30 minutes to meet Marklin, he did not know that the Lamey family, Pelham police and his colleagues were all at a nearby hotel waiting to surprise him. When he arrived, the entire group was there and Marklin gave him the keys to the SUV he drove to Alabama, a Ford Escape. 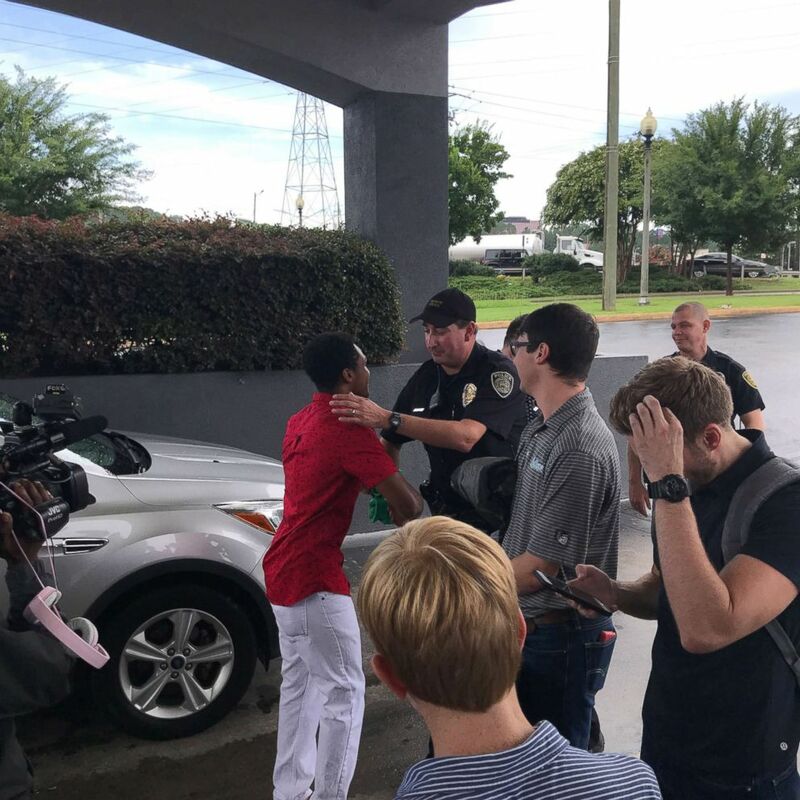 Alabama college student Walter Carr reacts after being given a new car by Bellhops CEO Luke Marklin in Pelham, Ala., July 16, 2018. Carr's car broke down just before his first day of work made the 20-mile journey on foot. "Walter truly raised the bar," Marklin said. Lamey said her family will be inspired by him whenever they have tough times. "He’s like the poster boy for no excuses," she said. "He’s just got this deep faith, he wasn’t alone." Carr said he was so happy that he had touched people with his story and that he was blessed to bless others.